Model TF04 RTD & Thermocouple Probes are resistance thermometers and thermocouples manufactured to DIN 43770 and are made of a sturdy, heavy duty stainless steel protective tube, a replaceable measuring insert and a connecting head. The standard protective tubes are available with a male-threaded fitting, sliding flange or for welding. Other options are available with fixed flange, sanitary flange or clamp connection. Apart from the Form B connecting head, other designs like Form A, stainless steel field housing etc., are available. 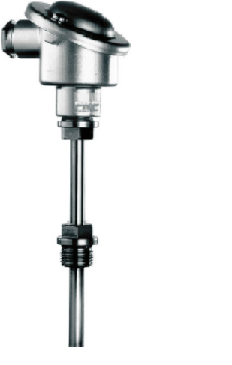 The measuring insert is a Pt 100 sensor, Class B (optional Class A) or a model K (NiCr-Ni) thermocouple. Alternatively, other resistance sensors or thermocouples can be supplied. As an option, these temperature probes can be fitted with a transmitter, which can be set at the factory to customer specification for a specific measuring range.